Pune has catapulted to the forefront as a business destination during the last five years. At the beginning of this decade, the only foreigners I saw in Pune came here for spiritual enlightenment or yoga. Many wore robes of the Osho commune or stayed as paid-guests near Pune's famous yoga institute. Now, most visitors are here clearly for business reasons: Americans, Europeans and Koreans with their laptops and Blackberries. 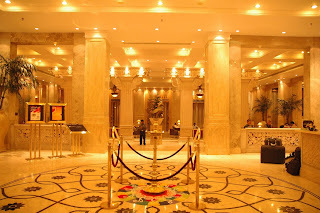 >> The Le Meridien: The most lavishly built of the three; the food in their restaurants have gotten better too; the rooms haven't been refurbished in some time. 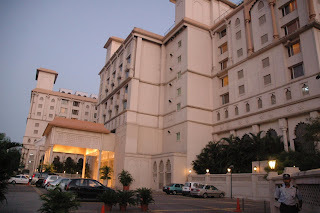 >> Taj Blue Diamond: Smaller in size, but great service; good Chinese restaurant; newly refurbished rooms. >> Sun N Sand: Not part of a well-known chain; good service and good restaurants. In the last few years, demand has outstripped supply. Bookings have to be made months in advance and room rates have gone sky-high (up by 40% in 2006 alone). 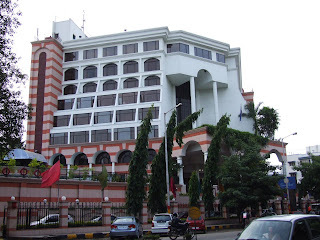 Together the five-stars in Pune only have about 500 rooms. >> Lemon Tree - In addition to their hotel in Hingewadi, they are building another one near the Railway Station (they have taken over the old Amir Hotel here). >> Taj's Ginger is building their second hotel in Hinjewadi. They already have one in Pimpri. Overall, Pune will add 4500-5000 additional rooms in all hotel categories by 2010-11 according to Knight Frank Research. Another awesome post. I immediately shared it with my business partner in US who was looking for some cheaper options than le meridien when she comes down in mid 2008. @vishal: Glad to be of help. If she does choose another hotel, I would like to hear about the experience too. Never been there but I heard of Pune quite a lot this year. Seems to be a popular destination! Best Sushi at the O hotel , finally a hotel that also offers rooms unique in its style , not the boring std ones . @manan: That's what I have been hearing. Finally Pune gets some Japanese food. The only other sushi place was Silk Route in Koregaon Park, but I have steered clear so far. pune coimg up with 42 new hotels, another addition in the town is by-Welcomgroup budget business chain - Fortune INN Jukaso, 2 kms from Airport, nice cosy hotel with all the necessary requirements of a business travellers.. I'm always looking to try out new places to eat. Stumbled across your blog accidentally and I must say there are lot of places which I haven't tried out yet ... my forthcoming weekends are booked :) Keep up the good work. Can any one guide me if The O Hotel is a good choice for one night in Pune. Our (me and wife) main purpose is relaxing for one night, while coming for Dagduseth Halwai's Ganpati Mandir.